Try it yourself. It's Free. No commitment and no payment information required. 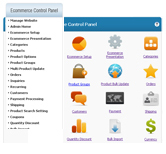 Feature-Rich Shopping Cart delivering outstanding E-commerce Websites and Solutions! Breakthrough Technology, giving you the most tools and features anywhere!